Below are my thoughts from the daily Bible reading of the West Side Church of Christ. Today’s reading comes from Joshua 19-21. Before reading I invite you to pray and asked God to speak to you as you read his word. Sometimes reading about the land of the Israelites gets me all confused. 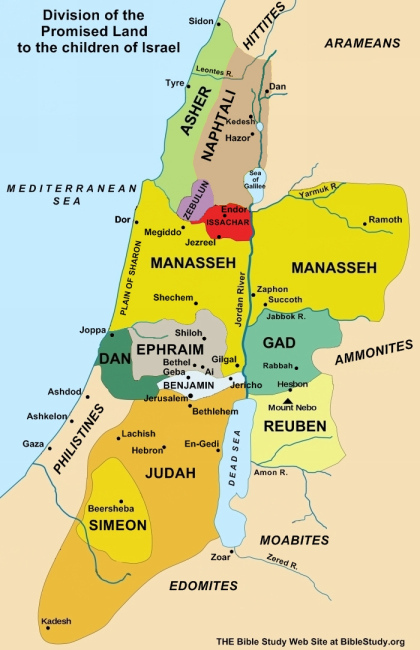 Because I have seen maps, read this several times, and have oriented myself over the last several years with the land of Israel I have a decent idea where some of these places and tribes are located. However, a good visual is always nice. So here is a picture of the Promised Land and the divisions among the tribes. Photo credit found through clicking here. “So the Lord gave Israel all the land he had sworn to give their ancestors, and they took possession of it and settled there. The Lord gave them rest on every side, just as he had sworn to their ancestors. Not one of their enemies withstood them; the Lord gave all their enemies into their hands. Not one of all the Lord’s good promises to Israel failed; every one was fulfilled.” Joshua 21:43-45 NIV. God delivered on the promises he made to the Israelites. They followed him and he shared with them the promises. But what I love is the line in verse forty-five … “Not one of all the Lord’s good promises to Israel failed” … you might ask … did some of his promises not go through? Yes, remember the promises where he said hardship would follow if they did not keep their end of the covenant. They kept it so they got the good promises and not the bad. God wants to and will deliver the good promises he has made for us. We simply have to follow, believe, and do what he asks. How are you doing at that?